Erected 1894 by Confederate Soldiers & Sailors Monument Association. Location. 37° 31.6′ N, 77° 25.067′ W. Marker is in Richmond, Virginia. Marker can be reached from the intersection of North 29th Street and Libby Terrace, in the median. Touch for map. This 100-foot monument is located in Libby Hill Park. Marker is in this post office area: Richmond VA 23298, United States of America. Touch for directions. Other nearby markers. At least 8 other markers are within walking distance of this marker. The View That Named The City (within shouting distance of this marker); "Richmond" (within shouting distance of this marker); The Navy Yard of the Confederate States (approx. 0.2 miles away); Rocketts Landing (approx. 0.2 miles away); Great Ship Lock (approx. 0.2 miles away); a different marker also named Great Ship Lock (approx. 0.2 miles away); Confederate Navy Yard (approx. 0.2 miles away); Coffer Dams (approx. 0.2 miles away). Touch for a list and map of all markers in Richmond. More about this marker. This memorial to Confederate enlisted men was designed by City Engineer Wilfred Cutshaw. He modeled it after Pompey's Pillar in Egypt. A 17-foot bronze soldier by Richmond artist William Ludwell Sheppard stands atop a 73-foot Corinthian column. 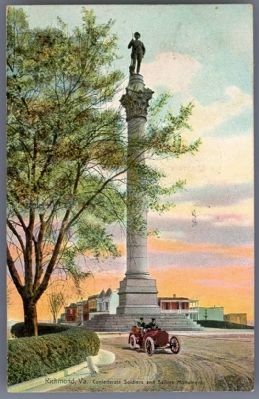 The column is composed of 13 stone cylinders representing the 13 Confederate states. 3. 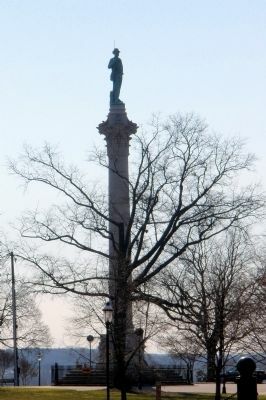 Confederate Soldiers & Sailors Monument on Libby Hill. 4. 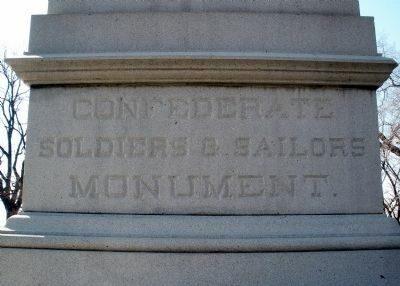 Confederate Soldiers and Sailors Monument, Richmond, Va.
More. 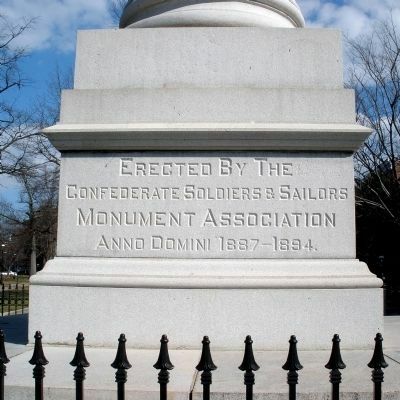 Search the internet for Confederate Soldiers & Sailors Monument. Credits. This page was last revised on June 16, 2016. This page originally submitted on February 17, 2009, by Bernard Fisher of Mechanicsville, Virginia. This page has been viewed 1,301 times since then and 12 times this year. Photos: 1. submitted on February 18, 2009, by Bernard Fisher of Mechanicsville, Virginia. 2. submitted on February 17, 2009, by Bernard Fisher of Mechanicsville, Virginia. 3. submitted on February 18, 2009, by Bernard Fisher of Mechanicsville, Virginia. 4. submitted on May 10, 2012, by Bernard Fisher of Mechanicsville, Virginia. • Craig Swain was the editor who published this page.